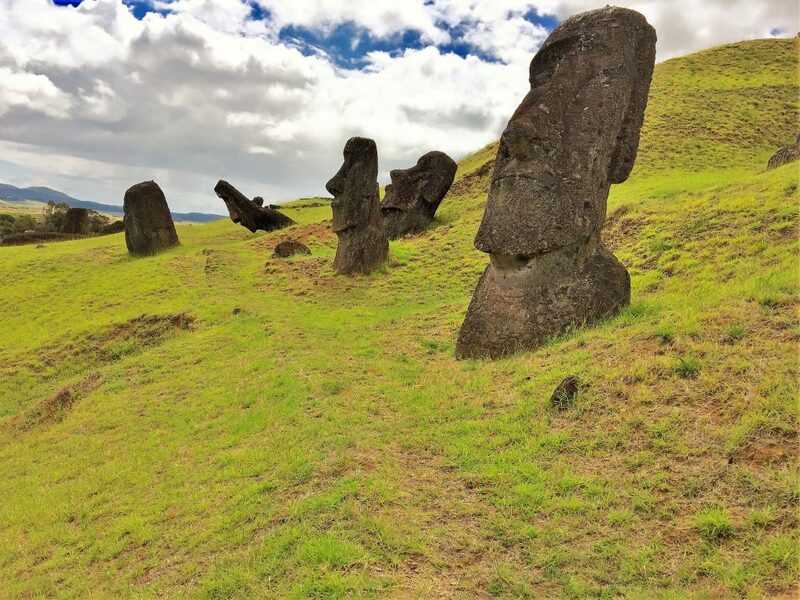 A Holy Grail among seasoned travelers, mysterious and mystical Easter Island is a speck of land of 63 square miles in the middle of the Pacific Ocean – one of the most isolated spots on the planet. 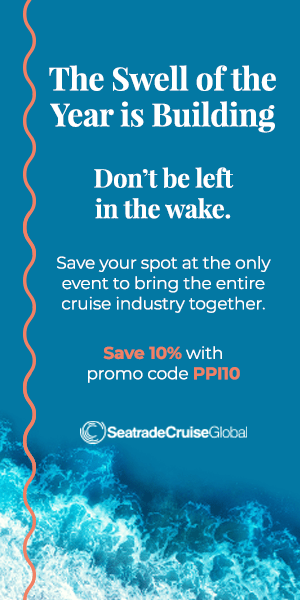 And not only is it isolated, but also its waters are prone to big swells that make cruise ships’ tender operations at best tricky. And weather and sea conditions can change quickly. 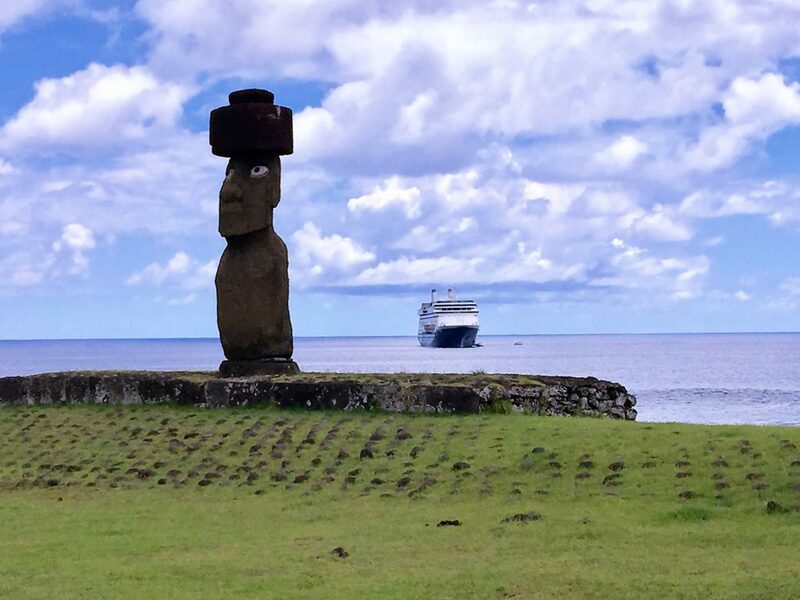 As our local guide put it, “the weather here is like Polynesian women – you don’t know what’s coming!” World Cruises and other grand voyages include Easter Island as a highlight on their itineraries. 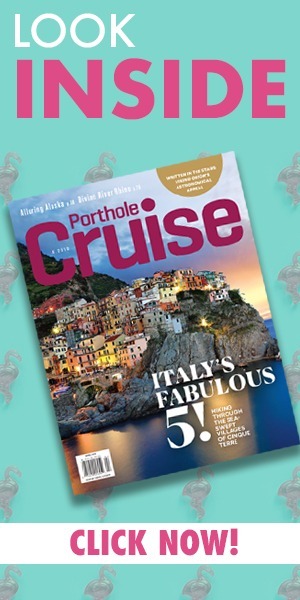 My husband Humberto and I have visited it three times, the latest one this February during the 2019 World Cruise of Holland America’s Amsterdam. Easter Island was annexed by Chile in the 19th century and called Isla de Pascua (Easter Island in Spanish); Rapa Nui is its Polynesian name. The island was first seen by Europeans on Easter Sunday in 1722, when Dutch navigator Jacob Roggeveen came upon it. 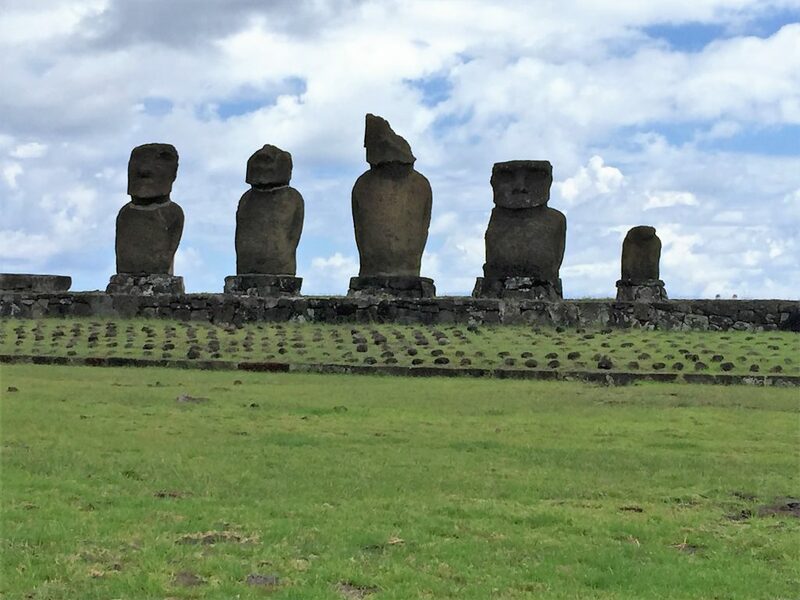 Those who have studied Easter Island calculate that the Rapa Nui people settled here around 700 A.D. coming from Eastern Polynesia, and that they created the large Polynesian-style “moai” sculptures between 800 and 1600 A.D. to honor ancestors. These monumental statues have made the island world-famous. By the time the Europeans came there were just a few thousand inhabitants on the island, and it had been deforested and depleted. By the 19th century a little more than a 100 Rapa Nui people remained. Most of the island, with three volcanoes, lakes and villages, is national parkland and a UNESCO World Heritage Site. And it is as “exotic” as exotic gets – I mean, how many people do you know who have actually set foot on Easter Island? 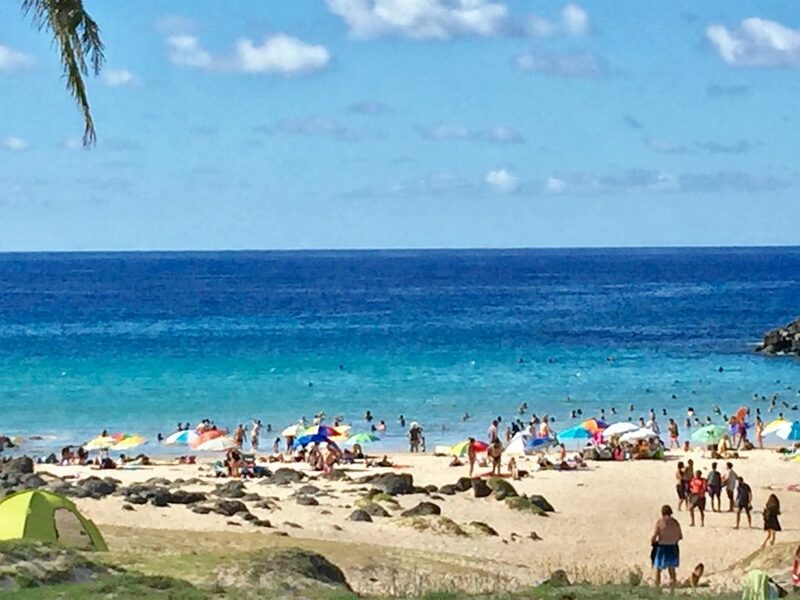 The tiny island has nearly 1,000 moai. These are enigmatic, monolithic, monumental statues carved from tuff or tufa (volcanic rock) depicting humans, and sometimes called “Heads” or “Big Heads.” The statues do have large heads (a three-to-five ratio between the head and the trunk) but the name “Big Heads” may come from the fact that some of the statues are half-buried by centuries of exposure to the elements – thus looking like “Big Heads,” sitting on top of the ground, but the rest of the body is simply underground. Characteristics of the statues include heavy brows, elongated noses and lips that protrude in a thin pout. Some statues are depicted with a type of headdress or hat. The mysticism associated with the statues. One of our local guides, Carlos, told us that the statues acted as “antennas.” Placed over graves of distinguished ancestors believed to possess “manna,” a supernatural quality that protects people, they “beamed” the “manna” from the ancestors back to the living through their eyes. 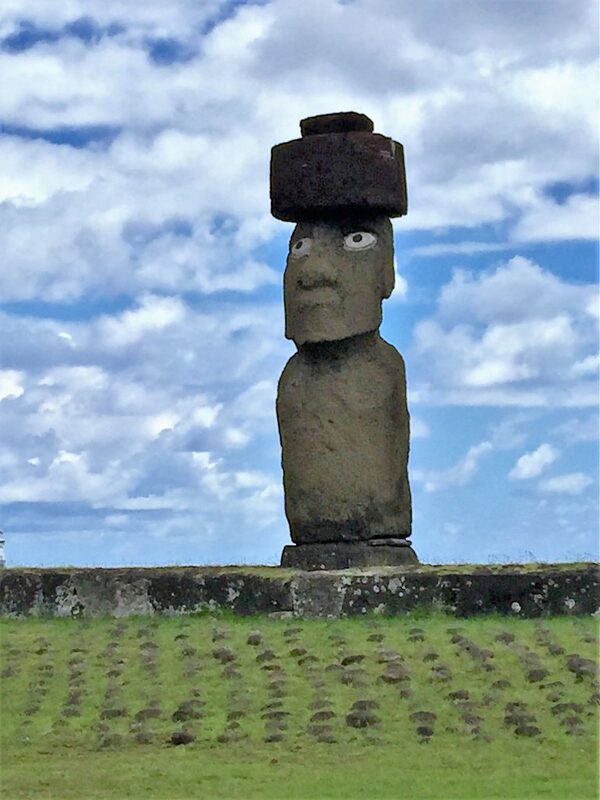 We toured the ceremonial site of Tahai in the town of Hanga Roa, where statues are displayed on altar-like platforms called ahu, including one statue with its eyes inserted. The eyes, made of shell and stone, may have been inserted in the old days for special occasions only for fear that the eyes would be stolen if left on the statues always. I stared into the eyes of the statue that has them inserted and, what can I say, I could swear I felt something. Scientists have yet to solve the enigmas surrounding the statues including how these heavy volcanic material works of art (some weighing as much as 82 tons) were moved to their present positions by a Stone Age culture. 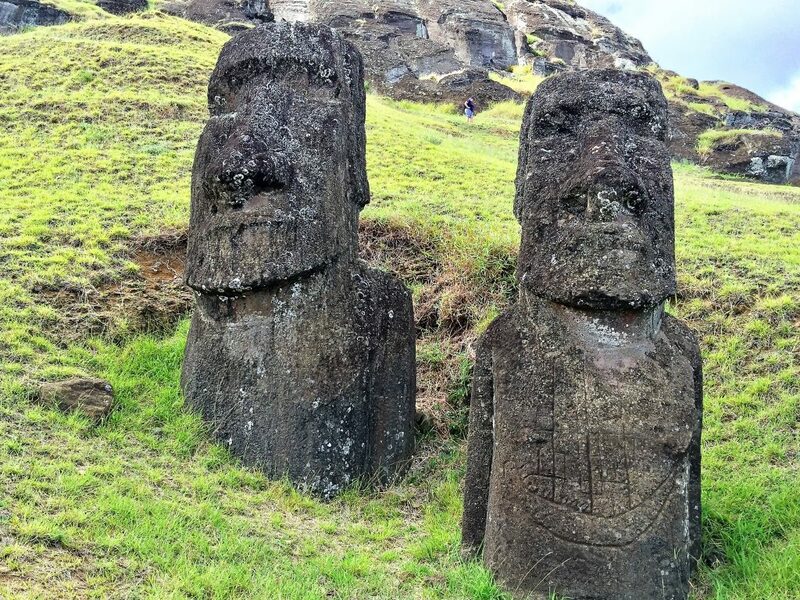 Theories include that the “moai” were rolled into place on tree trunks, that extraterrestrials beamed them down, and last, but not least, that the statues “walked” to their positions. The statues face the land, presumably to protect the people of the island. No visit is complete without seeing the volcano that was turned into the main quarry for the “moai.” The quarry, another of the sites we toured during our latest visit, has about 400 “moai” scattered around including the largest of the island. Of the 400 statues about half are finished and the rest were never completed. Among the unfinished statues is a 71-foot-high one estimated to weigh 200 tons. Some of the statues on hillsides in this site are the famous “Big Heads” – with the rest of their bodies buried through centuries of exposure to the elements. A volcanic crater with a picturesque lake, it overlooks an ocean, that like the waters off Santorini, is sapphire in color. A largest ceremonial center of the island with the Pacific Ocean on its back. It has an impressive 15 “moai” displayed on an ahu that make for memorable photographs. One of them is 30 feet tall. A is a stone village and ceremonial center we visited on a previous voyage that is associated with the cult of the “bird man,” a competition to select the “bird man” who would rule the island for one year. Orongo has ruins and petroglyphs.